The Government's 12-point proposal to introduce control orders, preventative detention powers and to update sedition offences culminated in the Anti-Terrorism Bill (No. 2) 2005. On 3 November 2005, the Senate referred the Bill to the Senate Legal and Constitutional Legislation Committee for inquiry and report by 28 November 2005. Despite the fact that only 8 days were allowed for discussion of the Bill, the Senate Committee received over 400 submissions, plus many more in pro forma format from members of AMCRAN, Civil Rights Network and other organization. AMCRAN extends its thanks to members who sent in submissions to the Senate Committee Inquiry at the time. You may view these submissions from here. AMCRAN members also made contributions to the Laws for Insecurity? A Report into the Federal Government's Proposed Counter-Terrorism Measures (Submission 81 to the Inquiry). AMCRAN's submission is listed as submission number 157. Recommendation 1: The Bill should not be considered for passage until after the review of the Security Legislation Amendment (Terrorism) Act 2002 (Cth) is completed in 2006. Recommendation 2(a): In view of changes that are both serious and have been introduced urgently, a 3-year sunset clause should be applicable to all provisions of the Bill. Recommendation 2(b): If Recommendation 2(a) is not accepted, the review of the legislation should be brought forward to three years rather than 5. Recommendation 3(a): "Advocating terrorism" should be removed as a ground for proscription of an organisation. Recommendation 3(b): If Recommendation 3(a) is not accepted, and if "advocating terrorism" must be an offence, it should be made a personal offence and not an offence relating to an organisation. In this way, the impact of a person's action is limited to just that person. This would be similar to a more narrowly defined version of the sedition offence. (iv) the statements are made on more than 5 occasions. Recommendation 4 (a): In view of the very real possibility that many innocent people could be affected, and that such laws would reduce charity and support for people in need, Sch 3 Item 1 relating to Financing of Terrorism should be removed. Recommendation 4 (b): If Recommendation 4 (a) is not accepted, the punishment for recklessly collecting funds should be reduced to 5 years imprisonment, rather than 15 years imprisonment. Recommendation 5: Since the measures available under ‘control orders' are punitive and not security-related, the test should be changed from one of "balance of probabilities" to one of "beyond reasonable doubt". Recommendation 6 (a): That control orders only apply on a single occasion (similar to preventative detention measures), and can not be rolled over unless there is compelling fresh evidence of a different type of threat or further training with a terrorist organisation. Recommendation 6 (b): If Recommendation 5(b) is not accepted, that control orders be limited to a certain number of re-applications, for example, 3 occasions. Recommendation 7 (a): That the grounds for having trained with a terrorist organisation be removed as a reason for granting a control order. Recommendation 7 (b): That the grounds of having trained with a terrorist organisation for seeking a control order not apply retrospectively, but only to people who train with a terrorist organisation after the commencement of the act. Recommendation 8: That in a manner similar to questioning warrants, ex parte processes only be used where there are reasonable grounds to believe that the subject of a control order will fail to be present or disclose the existence of the control warrant. In normal circumstances, a person is ordered to appear at a particular place and time but is not subject to the control order until the hearing is complete. If this is not the case, then the police may request ex parte proceedings. Recommendation 9 (a): That the preventative detention regime be removed from the Bill. (iii) in deciding whether to grant a prohibited contact order the judge must consider if it will impede a person's ability to get access to appropriate legal advice and/or other support services. Recommendation 10 (a): In view of the risks it carries and the potential for abuse in the aftermath of a terrorist attack, that the capability to detain innocent people not suspected of being involved in a crime be removed from the preventative detention regime. (i) Requiring approval from the Commissioner of Police and Attorney General for a Section 104.4(6) preventative detention warrant. (ii) The issuing authority must be satisfied that all other means to protecting the evidence have been explored and are not achievable. (iii) Detention in such periods should last until the particular evidence required has been adduced or seven days at most, whichever comes first. Recommendation 11: In view of existing powers available to Federal and State police, Sch 5 of the Bill granting police additional ‘stop and search powers' should be removed. Recommendation 12: That a limit be placed on the size of an area declared as a "prescribed security zone," within which police may exercise carte blanche stop and search powers. Recommendation 13: Given that the sedition laws have been roundly condemned by many groups, and that it is likely to be amended shortly, the sedition offences should be removed from the Act. An amended version which includes "advocating terrorism" but with tighter definitions could be added as a separate act once the new offences are introduced. Recommendation 14: That the measures in Schedule 10 that weaken existing safeguards on ASIO powers by extending the duration of warrants (i.e. search warrants; postal warrant; delivery warrants) be excised from the Bill. The Senate Committee held public hearings in Sydney over 3 days, and heard from many organizations including Gilbert + Tobin Centre of Public Law, Law Council of Australia, HREOC, and PIAC. AMCRAN's appearance was on 17 November 2005. The transcripts of the hearings are available here. Question 2 [Senator Joe Ludwig] The impact on the Muslim community of financing offences, and the effect of informal transfer through ‘Hawallah' networks. On 28 November 2005 the report of the Inquiry was tabled before Parliament. It included over 50 recommendations for amendment to improve the Bill. The Report talks about the specific concerns of the Muslim community at paragraphs 2.16 to 2.18. A copy of the report may be viewed here. The Anti-terrorism Bill (No 2) passed through the House of Representatives on 29 November 2005, and through the Senate on 6 December 2005. Now enacted, the legislation affects major changes to the Crimes Act 1914 (Cth) and other key Federal legislation. One of the more controversial new amendments to the anti-terror laws in the Bill was the new criteria for proscribing, or banning, an organisation as a terrorist organisation, if that organisation "advocates" terrorism. But the new laws do not specify what factors will be taken into account when proscribing an organisation under the new criteria. AMCRAN and a number of other organisations have questioned how this new criteria will be interpreted and applied. For example, would an organisation "advocate" terrorism if one member of the organisation made a comment and thus making the organisation liable for proscription? Or does it have to do with the stated position of the organisation? How exactly does an organisation "advocate" terrorism? Before the Anti-Terrorism Bill (No. 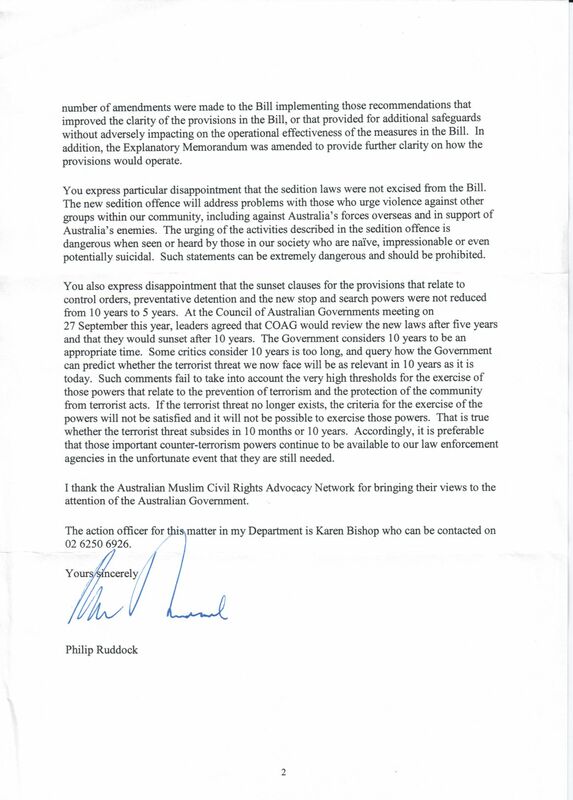 2) passed both Houses of Parliament, AMCRAN wrote to the Attorney-General enclosing a copy of our submission to the Senate Inquiry about the Bill. 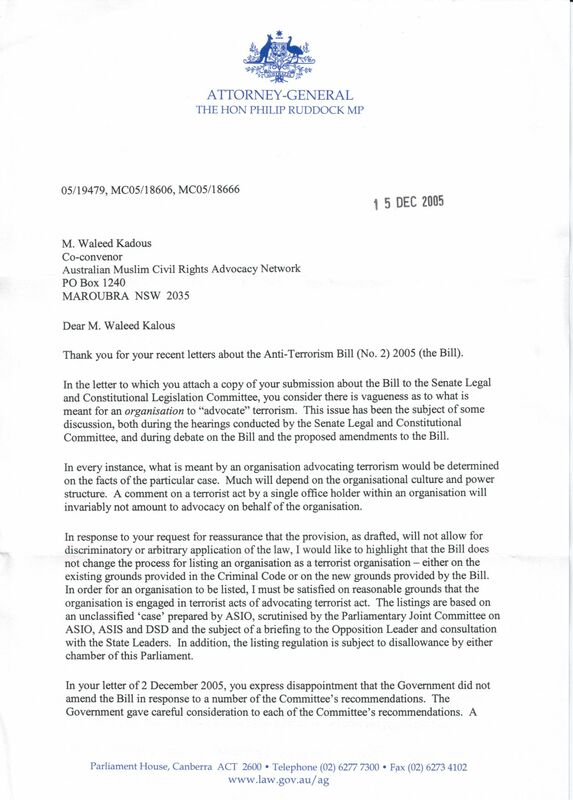 Citing the vagueness of the term "advocate terrorism", we asked the Attorney-General for guidelines as to how it would be interpreted; we sought clarification in the Bill as to how "organisation" will be defined as a single entity that "advocates" terorrism; and lastly, we sought reassurance that the provisions would not allow for discrimination or arbitrary application. In our submission to the Senate Committee conducting the Inquiry into the Bill, we made a number of suggestions as to what appropriate factors should be taken into account when an organisation is to be proscribed. A number of these recommendations were picked up by the Senate Committee and they were included in the final report. Even though the Government accepted a number of recommendations from the Senate Committee report, their specific recommendations as to how an organisation "advocates" terrorism were not. We wrote again to the Attorney-General seeking further claification. In December 2005, AMCRAN co-ordinated a community education seminar to discuss the effects of the amendments to the anti-terror laws. AMCRAN invited Dr Ben Saul from UNSW and Gilbert + Tobin Centre of Public Law to address the public seminar about these issues. What are the implications of these new anti-terror laws for the Muslim community? What do the new sedition offences mean? Will we still be allowed to say Iraqis have the right to resist occupation? Will we be allowed to comment on and criticise government policy? money to the wrong people, and what does it mean for my organisation?